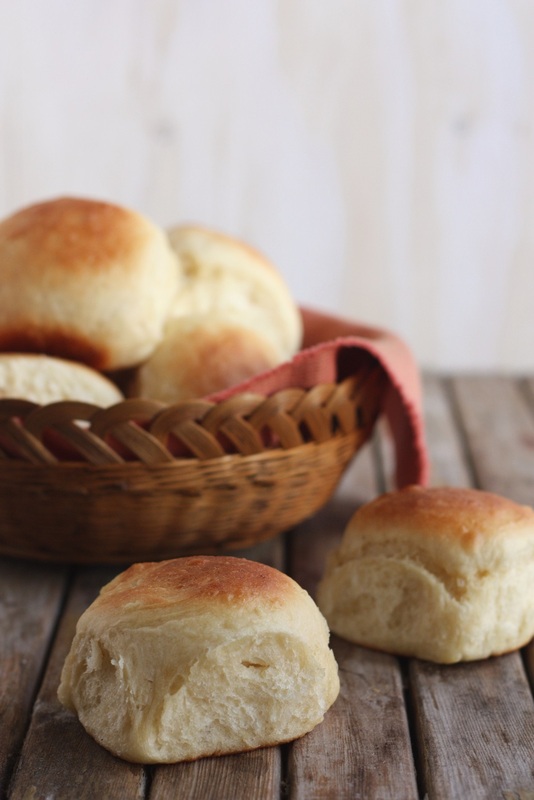 Tender, fluffy rolls hot from the oven are a must have for your holiday dinner. Measure 2½ cups of the flour into large mixer bowl. Add yeast; blend. Measure water, shortening, sugar, and salt into a pan. Heat until warm (120-130°F), stirring constantly. Pour into flour-yeast mixture. Add eggs. Beat ½ minute at low speed, scraping bowl. Beat 3 more minutes at high speed. STOP MIXER. Gradually add more flour to form a soft dough. Scrape down dough from sides of bowl. Cover first with wax paper, then with aluminum foil. Refrigerate no more than 3 days for best results. Punch down dough every 30 minutes for the first few hours until it is chilled, then once a day. When ready to make rolls, take only as much dough as is needed at the time. Cover and return rest to the refrigerator. 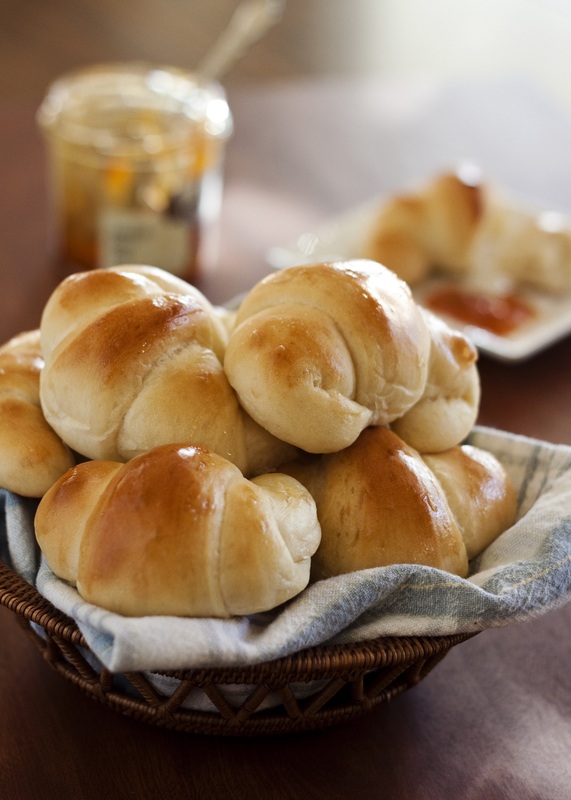 Shape rolls. Cover and let rise in warm place until doubled, 1 to 2 hours. Bake dinner rolls on baking sheet 10 to 20 minutes, depending on size, in preheated 400°F oven. Remove from pan and set on rack; brush with butter. For crescent rolls: Roll ¼ of the dough into a 10-inch circle. Cut into 12 pie-shaped pieces. Roll each piece of dough from the wide side toward the point, stretching the dough slightly as it is rolled. Place on baking sheet a little apart; curve ends. For twisted shapes (such as snails): Roll dough into oblong 6-inches wide and ½-inch thick. Cut strips ½-inch wide. Twist and hold one end of the strip down on baking sheet. Wind strip around and around. Tuck end underneath. For cinnamon rolls: Roll ⅓ the dough to a 9x18-inch rectangle. Brush with 1 TBSP butter, and then add ½ cup light brown sugar mixed with 2 tsp cinnamon. Roll up, starting at wide side. Seal by pinching edges of dough into roll. Stretch roll to 20 inches. Tie off (see below) into 20 slices, and place in buttered 9x13x2-inch pan or a little apart on buttered baking sheet. Cover and let rise until indentation remains after touching. Bake about 30 minutes in preheated 375°F oven. Brush tops of rolls with milk and sprinkle with sugar. Note: ⅓ to ½ cup raisins, currants, or nuts may be added to the above cinnamon/sugar filling. To "Tie-Off" dough, take a piece of strong thread or dental floss, about 16 inches long, slip under roll of dough and cross on top to cut slices smoothly and quickly. Red Star Yeast recipe featured at Barbara Bakes.